The iPhone 4s will not receive any updates after iOS 8, so it’s important that Apple provide smooth performance on all versions of iOS 8. The iOS 8.1.1 update was mainly aimed at the iPhone 4s users and provided some performance improvements over iOS 8.1. It is believed that iOS 8.2 will provide some more performance improvements for iPhone 4s users and hopefully eliminate any sluggishness. YouTuber kabriolett has set out to find out just that and compares iOS 8.2 beta 2 with iOS 8.1.2 on the iPhone 4s. As per the video comparison, the iOS 8.2 beta 2 is slightly faster when it comes to opening/closing applications and other operations. 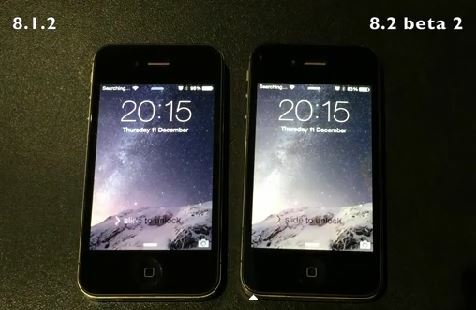 The iPhone 4s does have an aging A5 processor and not enough RAM to run iOS 8 as fast as it runs on the newer devices. However, there are slight improvements in speed with newer iOS versions and iOS 8.2 beta 2 does show that. The final version will have even more bugs fixed and perform more smoother on the iPhone 4s. iOS 8.2 update will mostly come in the first quarter of 2015, along with the release of Apple Watch. How’s iOS 8.1.2 running on your iPhone 4s?